As someone with temperamental skin, I like to have a face mask in my collection for every skin concern. I've gone from having an oily, acne-prone complexion to dehydrated and easily irritated, but I would say that my skin is somewhat in the middle at the moment with dry patches and the occasional blemish. I have a fair few masks in my collection at the moment, so I thought I'd share with you my favourite for each one of my problems. For Sensitive Skin | I've had sensitive skin for as long as I can remember and my skin tends to react to the oddest formulas so there's no judging if something is going to irritate me or not. When my skin is feeling sensitive however, I always reach for the same masks; the Glossier Moisturising Moon Mask being one of my top picks. It hydrates, but it calms the complexion at the same time, making it great for redness too. For A Dehydrated Complexion | My favourite face masks are the one's that combat dryness and I tend to get the most out of these ones. The Glow Recipe Watermelon Mask* was no doubt going to make it's way into my top picks as it nourishes my skin and makes it super soft too! The Fresh Rose Face Mask* is another favourite of mine as it improves how my skin feels for days after, which is something that not many masks do. With extended use, I feel like my skin looks a lot less irritated, more smooth and more hydrated too. For Clogged and Enlarged Pores | If you have sensitive, yet congested skin then I'd recommend the Glossier Mega Greens Face Mask as it really does help any blemishes I have while speeding up the healing process, yet it doesn't make my skin feel like it's on fire like other clarifying clay offerings. Although I'm skeptical about the majority of clay masks as I said, the Aesop Primrose Facial Masque* is another exception and it'd be great for anybody that loves an intense mask, because this stuff will make your face feel like it's set in concrete whilst you wait to wash it off. It works which is the important thing, but it's one I only use when I really need to because of how intensive it can be. For Improving Your Skin's Texture | I've recommended the The Ordinary's AHA 30% + BHA 2% Peeling Lotion to quite a few people as it's unlike anything else that I've ever used before. It draws out impurities, bringing them to the surface, so if you have a big event coming up it isn't wise to use this just before. It makes my skin feel brand new after using it and I love how smooth it makes my complexion look. 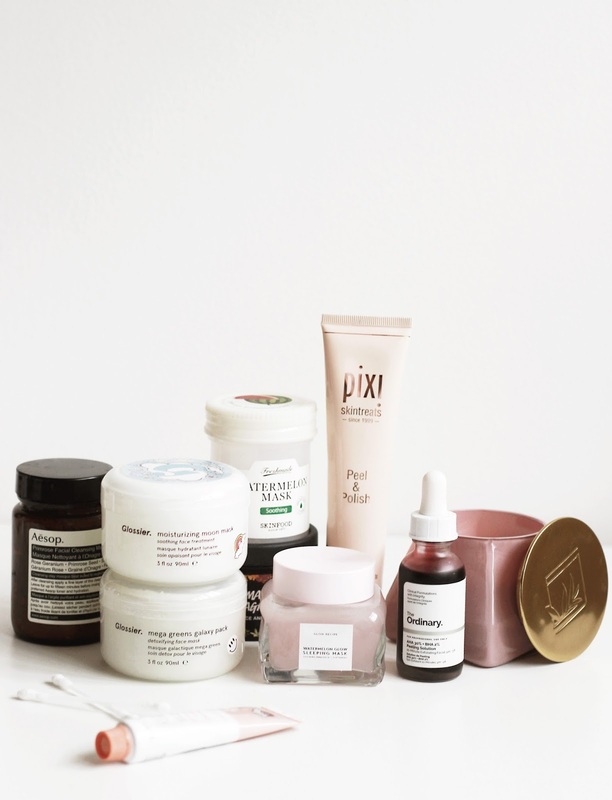 For Dullness | Although an exfoliator as well, the Pixi Peel and Polish can be used as a mask too and it's super fab when my skin is looking a tad lacklustre and in need of a pick me up. I simply apply it, leave it on for five minutes and then remove it - It leaves my skin feeling prepped and glowy, ready for makeup application. What are your favourite face masks?